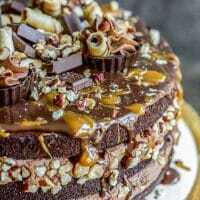 Nutella Brownie Cake - Home. Made. Interest. 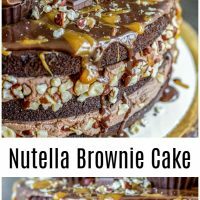 Alright guys, this Nutella Brownie Cake may be my most decadent brownie cake to date. 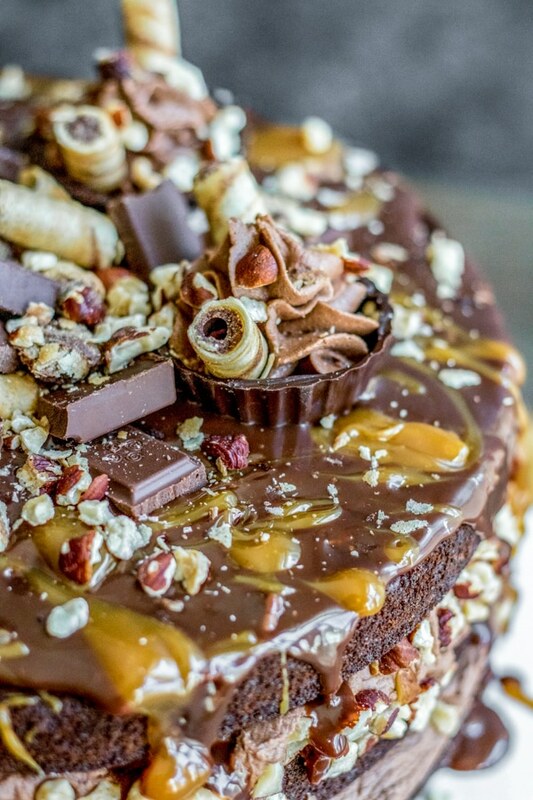 I mean the Brownie Chocolate Chip Cookie Dough Cake was amazing, and the Turtle Brownie Cake was oozing with delicious caramel and pecan flavor, but this Nutella Brownie Cake is layer upon layer of fudgy chocolate brownies, rich, Nutella frosting, and a smooth chocolate ganache glaze. 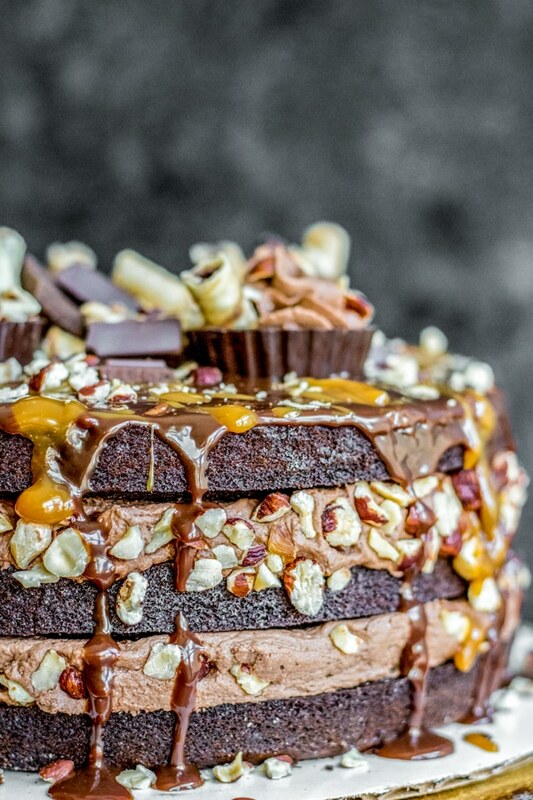 It’s what chocolate lover dreams are made of. Cream together 2 cups of unsalted butter and 4 cups of confectioners’ sugar. Add 1 cup of Nutella and continue mixing until fully incorporated. Chop up 2 cups of chocolate and place it in a bowl. In the microwave heat 1 cup of heavy cream until it is boiling (about 1 minute depending on your microwave). Pour the heavy cream over the chocoalte and let it sit for 30 seconds. Then stir the chocolate and cream together until the chocolate is fully melted and smooth. Note: If your chocolate doesn’t melt complete and the mixture has cooled down you can microwave for 15 seconds at a time until the ganache is smooth. 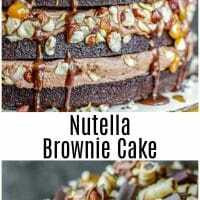 You can decorate your Nutella Brownie Cake however you like. 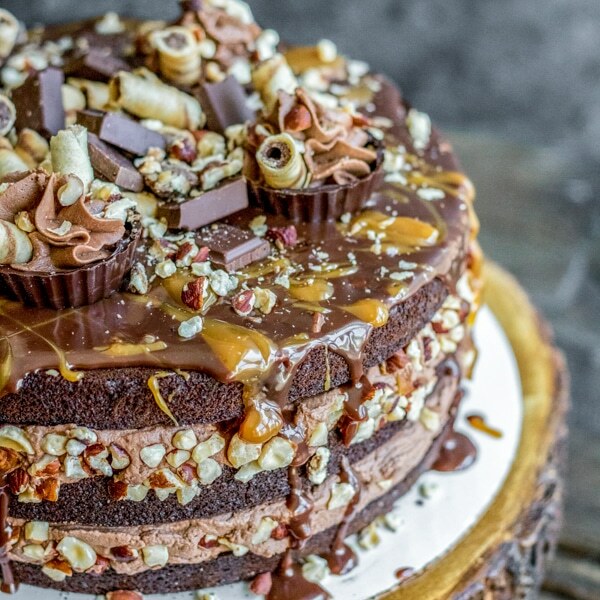 This is a pretty over-the-top cake so the more decorations the better in my opinion! Below are some of the things that I used. 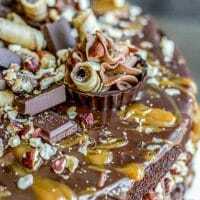 Want more brownie cake recipes? Like this recipe? 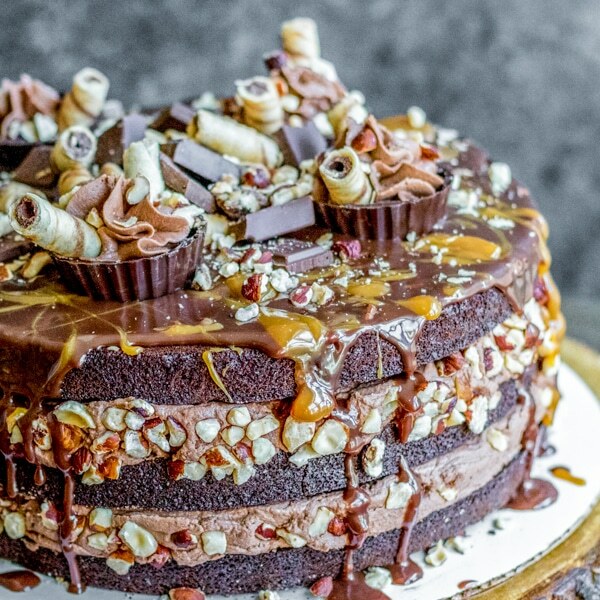 Pin it to your Desserts board! Mix the brownie batter according to package instructions and pour into 3 greased and parchment lined 9-inch round pans. Bake brownies following the instructions on the packaging for 8x8" brownie pan. While the brownies bake and cool make the nutella frosting. Cream together the butter and confectioners’ sugar. Add Nutella and continue mixing until fully incorporated. Heat the heavy cream in the microwave until it begins to boil, approximately 1 minute depending on the microwave. Pour the hot cream over the chopped chocolate stirring until completely melted and smooth. Once the brownies are completely cooled assemble the Nutella brownie cake starting with a layer of brownie, then spreading nutella frosting over it, brownie, nutella frosting, brownie. 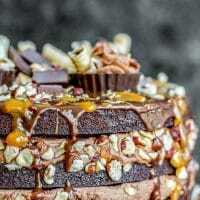 Pour the ganache over the top of the Nutella Brownie Cake and use a spatula to spread it over the top and make it drip down the sides slightly. Top with chopped hazelnuts, caramel, cookies.